We took the tender from our bay into the port to go for dinner. It was only about a mile around the headland, but quite choppy, especially when we hit the wake of the car ferry coming in from Valencia. Fortunately the boat stayed upright and we kept reasonably dry. Capsizing would have put a bit of a damper on the birthday celebrations. We ate at a nice "Mediterranean Fusion" restaurant in the old town, sitting outside in shirtsleeves. The weather is still surprisingly warm for mid-October, even for Ibiza. 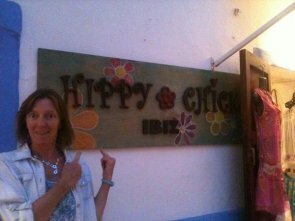 We also found the hippy market and the actual hippy chick shop.